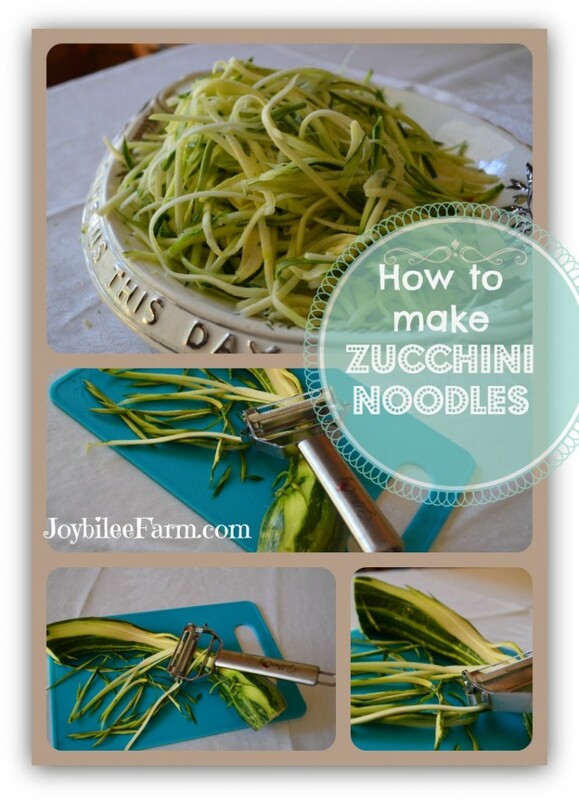 Have you seen those you-tube videos on making zucchini noodles at home? The ones I’ve watched use a fancy-schmancy spiral cutter that suction cups to your countertop. You insert the smallish zucchini into the pronged holder and turn the handle. The noodles spit out the end. You scoop them up off your counter top and place them on a plate or bowl. At least that’s what the guy did on the video. The gadget looks cool. It leaves a small core of zucchini that can be cut up small and added to your pasta sauce. Pretty neat. I was tempted to buy the machine on Amazon. It has 3 cutting blades that make low carb, angel-hair pasta from zucchini, plus spiral curly fries from potatoes and sweet potatoes, and paper thin vegetable slices for garnishes. It is a cool gadget and I have a kitchen gadget addiction. It was the first option I found for making low carb pasta from zucchini, butternut squash, and carrots. Looking at the ads on Amazon, I could imagine myself setting it up on my counter top, and spitting out oodles of low carb zucchini noodles on a regular basis. Using this machine I could disguise zucchini and sneak more healthy vegetables into the dinner menu. It looked fun to use. It offered another way to use up zucchini. I don’t need another machine that sits on my counter top. I have trouble growing zucchini in my zone 3 garden, so I don’t really have a lot of it. Zucchini is available in August and September so the machine would be used 2 out of 12 months every year. The machine is pricey at $25 to $40. The machine is plastic — I hate plastic kitchen stuff. Suction cups don’t work on my 20-year-old countertops — there’s nothing more frustrating than torquing a handle and have the suction cups give way on a gadget. There are better, easier to use, and more compact options. So I dug a little deeper, using you-tube videos on making zucchini noodles to get some ideas on other options. This wasn’t the easiest quest. The search terms for the gadget I was looking for included “spiral vegetable slicer,” “best way to julienne a carrot,” “vegetable spaghetti,” and “veggie pasta maker.” I started out searching “how to make zucchini noodles.” Some of the sites I found told me to just used my vegetable peeler and peel each noodle off the zucchini, one noodle at a time. I tried it. You’d laugh if you saw me. Seriously, this ain’t gonna happen. One noodle at a time for 4 people for dinner? Who has time for that? I admire those bloggers who have that much dedication to the low-carb, paleo lifestyle that they could spend that much time peeling off one zucchini noodle at a time. I know myself. I might do it once but there is no way that it would become a regular thing in my house. If I’m going to cook veggie pasta, it needs to be as quick as opening a box of spaghetti and dumping it in. No more than 5 or 10 minutes prep time. Max. So I explored this veggie pasta world a bit deeper, still using the search term, “how to make zucchini noodles.” I came across another gadget, “the spiral vegetable slicer.” It is a tube with a blade on the side. You insert the zucchini (or carrot or cucumber) into the end of the tube and turn the vegetable against the blade. The julienne noodles spit out the side of the gadget. A smallish core of uncut vegetable remains. This can be cut up and added to the sauce, in the same way as the remaining zucchini, with the spiralizer tabletop gadget I mentioned at first. It makes only one type of pasta — angel hair vegetable spaghetti. It can only be used with tubular vegetables like carrots, small zucchini, and small cucumbers. It’s smaller than the spiral cutter, countertop machine, but still bulky. In my continued search, I came across this handy, compact, stainless steel tool designed in Chicago — The UberChef julienne peeler. I ordered it on Amazon last Monday and it was here by Wednesday. It was a lifesaver because we got our first frost on Thursday. I went out to the covered garden bed and found all my squash plants black with death. I harvested a small basket full of young zucchini that had been kissed by frost. 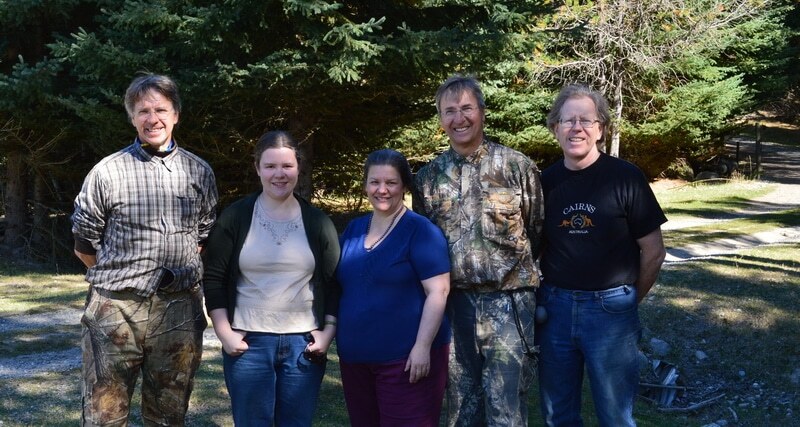 Then on Thursday, some friends showed up, unexpectedly, to hunt in our area. Of course, I invited them for dinner. For the next 4 days, we had 3 extra guests for dinner each night. And these guys were hungry. Dinner was after 9 each night because they stayed on the mountain looking for elk until the last light faded. Two dinners featured zucchini noodles — one in a stir fry, the other with spaghetti sauce. After that kind of work out, I can tell you unequivocally, I love this gadget. It’s stainless steel with a really sharp blade. There are no plastic parts. It makes easy julienne strips from any size vegetable. These can be used as a salad, a garnish or as a veggie pasta like I did with these zucchini noodles. It is slick and fast. Did I mention that the stainless steel blades are sharp? The tool glides down the length of your vegetable easily and your veggie noodles end up being as long as the vegetable. I turned 3 small zucchinis into enough zucchini noodles to feed 4 hungry men in less than 10 minutes. It was fun to use, without any hand stress. The blades clean up easily using my kitchen nail brush. It’s compact and fits easily in the drawer with my kitchen tools. It’s also a peeler, so with a single tool I can both peel and slice the vegetable that I’m working with. 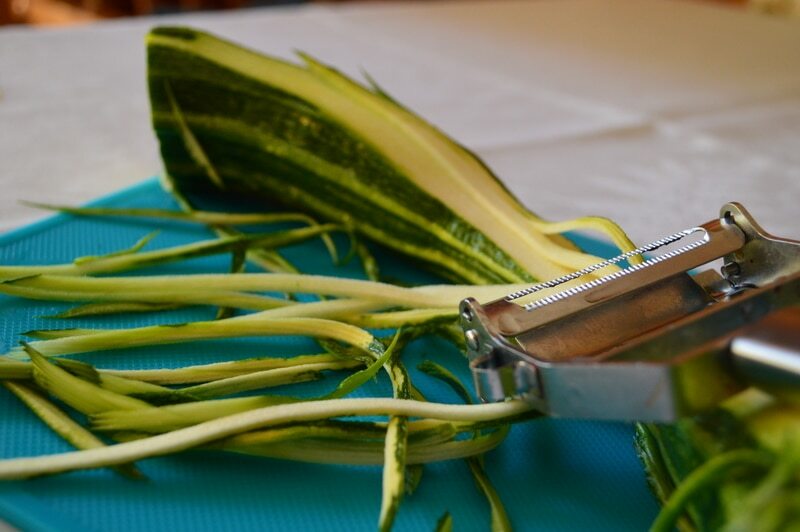 The size of the zucchini noodles can be varied by how firmly the julienne cutter is pressed into the zucchini. Large torpedo size zucchinis can also be used to make veggie pasta, as well as butternut squash, cucumbers, carrots, beets, pretty much any firm vegetable. The tool will last a lifetime. It won’t break if you drop it. It can also be used to julienne other vegetables for salads, and stir-fries. You aren’t limited to making zucchini noodles with this tool. You may want to buy two, especially if you have help with meal preparation. It was fast — as fast as using the more expensive gadgets. This was the lowest price option of the 3 options for cutting zucchini noodles. 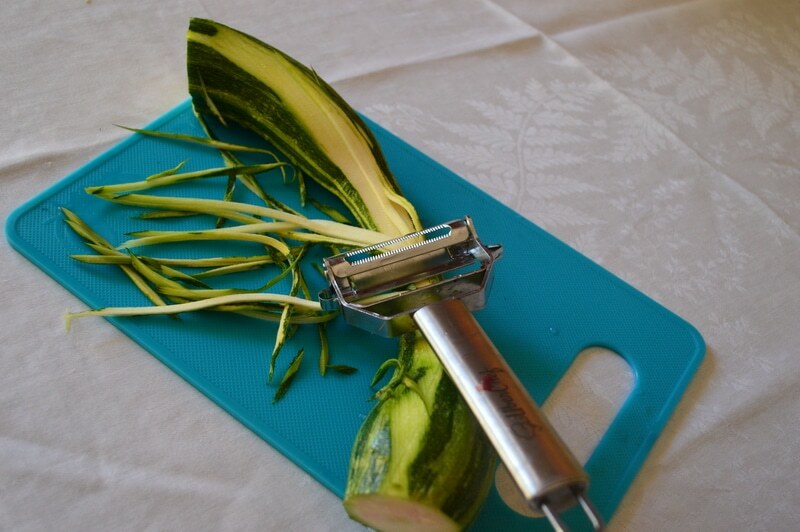 The tool is also a peeler and you can use it to make ribbon slices of zucchini noodles for veggie lasagna, too. It couldn’t be easier. Wash your zucchini. Cut off the blossom end and the stem end — or if your zucchini has had a frost and as beginning to turn mushy or show signs of mold, trim it thoroughly to remove any discolored portion. Place the zucchini on a cutting board. 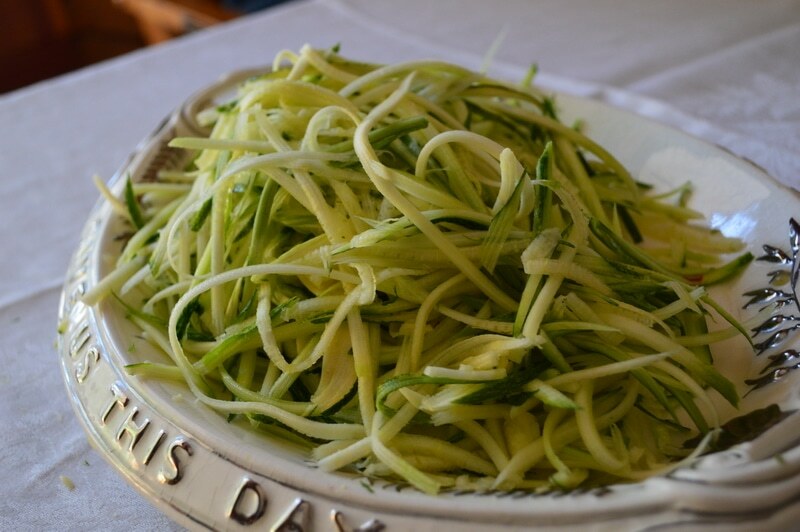 Have a bowl or plate ready to receive the julienne strips of zucchini pasta. Place the Uberchef tool on the end of the zucchini furthest away from you, with the julienne cutter against the vegetable. Pull the cutter toward you. The blade cuts perfect zucchini noodles, as it juliennes the vegetable. You can vary the thickness of the veggie noodles by how deeply you press the blade into the vegetable with each cut. I tried it out on zucchini, carrots, beets, and potatoes. It did an admirable job in all cases. On the shorter carrots from my garden, I had to hold the vegetable firmly with a fork, in order to keep my fingers out of the way of the blade. It’s very sharp. Zucchini noodles can be served raw with a hot sauce poured over the top, which would lightly cook the noodles on the plate. I stir-fried the noodles in hot coconut oil, just briefly for 2 minutes before serving. Just enough to wilt them. The texture was similar to al dente pasta. Zucchini is a neutral tasting vegetable and the noodles were a wonderful foil to spicy tomato sauce, topped with feta cheese. In fact, it was so yummy that I plan to buy zucchini at the grocery store this winter. I’ve never bought a grocery store zucchini in my life! You know I’m hooked now. Toss raw zucchini noodles into chicken soup stock, along with julienne carrots, and lots of parsley and let it heat in a slow cooker. The zucchini holds their shape and mimics wheat pasta admirably. Zucchini noodles can be used for an Asian Stir-fry — use ginger, tamari or soy sauce, and garlic to spice it up. Zucchini noodles can dress Italian with a tomato-basil sauce, an alfredo cheese sauce, or lots of browned butter and mizithra cheese. Try your veggie pasta in a lamb curry dish using turmeric, cumin, garlic, cayenne, cardamom, ginger, and coconut milk in the sauce. For more ideas in using zucchini noodles or veggie pasta in your menu check out my spice chart to make menu planning easier. One more thing. When I bought my UberChef Julienne peeler, I received a link to the Uberchef Cookbook that highlights 25 pages of recipes using julienne cut veggies. I wish it had pictures. It doesn’t. But there are a lot of ways to use julienne cut vegetables, in this bonus cookbook, and most of them are low carb. Included was a special discount code for 20% off your Amazon.com purchase of this Uberchef Julienne peeler or any other Uberchef product. (Coupon Code: LJFQGR8M). Veggie pasta is one of my goals in my personal quest to get healthier this Fall, cutting down on carbs, and eating more healthy vegetables. My goal is to lose some weight, get more energy, get rid of the mind fogs and sluggishness that eating pasta and other wheat products gives me. Switching to zucchini noodles is one step on the journey. Oh, and I’ve got another Julienne peeler on my wishlist at Amazon.com now. 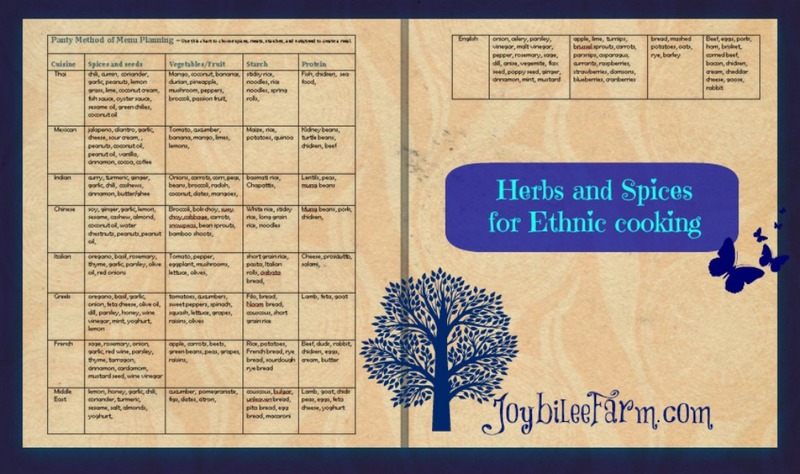 Just because I love working alongside Mr. Joybilee, and it’s hard to share a single peeler between two. He thinks this gadget is pretty cool, too. And he actually likes zucchini noodles. Who knew? Zucchini is a neutral tasting vegetable and low carb. The noodles were a wonderful foil to spicy tomato sauce, topped with feta cheese. Wash and remove the ends of each squash. Julienne slice each one into long thin pieces. Use a sharp knife to make even size cuts, use a mandolin slicer, or Uberchef julienne peeler if available, to save time. Serve raw with a hot sauce poured over them, which would lightly cook the noodles on the plate. Alternatively, briefly stir-fry the noodles in hot coconut oil, for 2 minutes before serving. Cook for just enough time to wilt them. Just started following your blog from Australia (I’ve been asking you Qs about bees wax wraps this past week) and saw your pic…and our friend Frank in it! Small world. You know Frank Piechnik, too? He’s a kind, generous, faith-filled wonderful soul. And the brother to the brother in law of my sister in law. Looks perfect and easy. I also dislike plastic and look for sturdy, long lasting tools. Thank you so much for this link. I want to buy two, one for myself and one for my daughter. I love zucchini and since I’m trying to lose weight I’m sure zucchini noodles will be much better for me than the regular one I’ve been using. I may not be able to use the coupon code when I order but I will be getting them. I too have checked into getting the one that makes curly fries from sweet potatoes since they’re supposed to be so much better for you than regular potatoes and am glad to have your opinion of it. I think you’ll like them, Molly. I used mine again tonight making sweet potato noodles. The coupon doesn’t have an expiry so I think it will still work for you. I haven’t used a curly fry cutter so I can’t offer an opinion. Sorry. I tried to order it but the link I followed does not ship to my Canadian address. Is there another link that may ship here? I’m gluten-free (not by choice) and really wanted to try the veggie noodles. So glad I waited on the others – ordered this one; can’t wait to try it! My second one is in the mail now. I think you’ll be very happy with your decision. Thank you so much for this article on Pinterest! I have a spiralizer but am giving to Goodwill because it is difficult to use. O I looked at the one with 3 blades but something else on the counter or underneath the counter to store. The Uberchef Julianne peeler is perfect for me! Going to purchase this! I think you’ll love it. I’m getting a second one. That’s so cool! Is your Uncle Andy or Frank? Andy is married to my husband’s brother’s wife’s sister. We just met Frank for the first time last week. Love them both!